I just wanted to say that we had great fun at the class and the food was wonderful. Probably the best my guests had all the time they were here. I've attached a couple of photographs for your amusement. Join in and write your own page! It's easy to do. How? 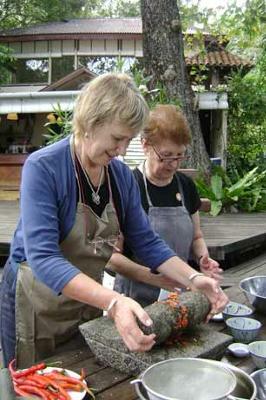 Simply click here to return to Cooking class testimonial..
Grinding fresh spices with the granite slab. I attended Nazlina's cookery course in November 2009. I booked for my first day in Penang as I guessed that other people there would be like minded foodies and so my holiday would start off on a good footing. The class was great,the recipes learned were delicious and the company delightful..add to that the perfect setting overlooking the sea and the experience can't be bettered. I have recommended this class to anyone who will listen! How lovely to hear from you. I am now back in the UK, it's fairly cold and damp, not like beautiful Malaysia. Absolutely loved the course and learning from you how to cook your traditional food. Thank you for the recipes. I will treasure them and cook the dishes for friends and family. The cookery day was the most enjoyable of the day trips I took, thank you for a wonderful day and for your tuition. Wishing you all the best with your next venture. We spent a morning with Nazlina in October last year and we loved every bit of it. We got to cook a few different dishes from scratch and enjoy it all afterward. A great hands on experience with a lovely teacher. The food in Penang is fantastic, but to be able to reproduce a taste of it at home long after the holiday is over is something special. 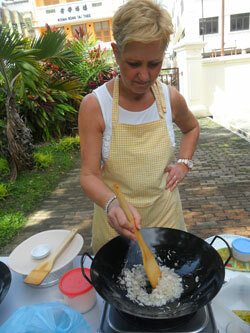 We would recommend Nazlina's course to anyone keen to learn some of the local secrets. friends with the beef curry dish and spring rolls that we made. We had a great time with Naz - everyone needs to do this in Penang! 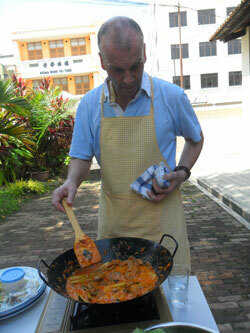 My partner Steve and I were very keen to learn how to cook some traditional Malaysian dishes while we were on our holiday. 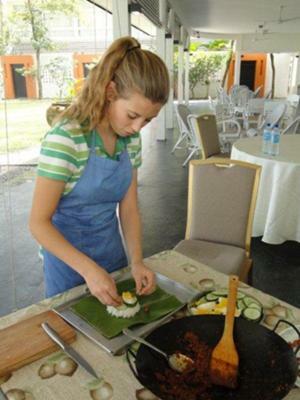 Our travel agent recommended the cooking classes at the Spice Gardens. We were lucky enough to have Nazlina as our teacher and she was amazing. The class was set outdoors in the beautiful spice garden overlooking the ocean, the view was breath-taking. We cooked a Malaysian prawn curry and traditional chili sambal with boiled eggs using a traditional griding stone to grind up the sambal paste. After the cooking we got to eat the food which was totally amazing. We would recommend Nazlina and her classes to anyone, she makes the lessons fun and interesting and we will now go home with some new skills. Happy moments at Tropical Spice Garden. 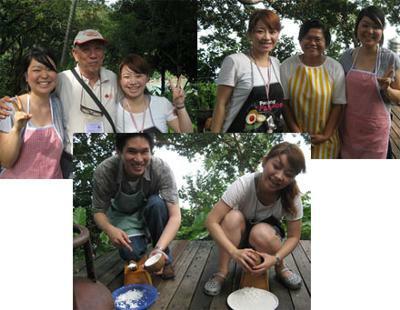 It was a wonderful experience to learn from Chef Nazlina with my friends from Japan. The girls were thrilled & excited to learn not only our culture but our food as well. 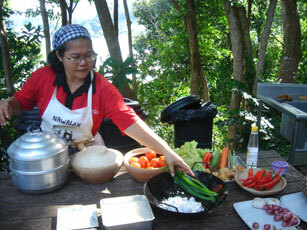 Chef Nazlina provided an interesting approach on how to prepare the ingredients. We will definitely visit Chef Nazlina again given the opportunity. Highly recommended & fun to learn. Gavin; and (on behalf of) Ms.Fujii & Ms.Uchihashi. Hope you had a good vacation!! We cooked up a storm with all these! I have to admit that it took me 12 years before I decided that my annual visit to Penang should be more than just a brilliant excuse to stay away from a kitchen. For someone who loves to eat and experiment with food and cooking this was really out of character, but I guess I felt that when you are on a holiday you try to stay away from the things you do most of at home. Penang has to be one of the best places on earth to eat. At any given time of the day or night you can delight in foods from a myriad of cultures. Chinese, Indian, Malay, European, Western, Eastern. They are all there for the asking, you will never go hungry in this multicultural labyrinth of colour and smells that tantalize and flirt with all the senses. It was on this 12th visit that I found Nazlina. Before I left Australia for my 2 month sojourn I had decided that at last my culinary laziness should be put to rest and I googled cooking classes in Penang. I was surprised and excited that Nazlina was holding her cooking classes at one of my favourite places. 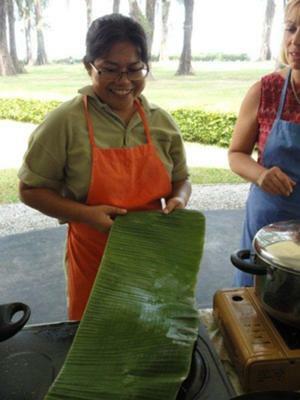 What better than to be learning to cook some traditional Malay food out in the open with a view to die for and a gorgeous little teacher who was to open my eyes to a way of cooking that was not easy but gave you a sense of achievement and satisfaction. This was work, the grinding, the shredding, the rolling, the chopping, squeezing, slicing, squatting,standing,kneeling. No oven or food processor here, blender or juice extractor. 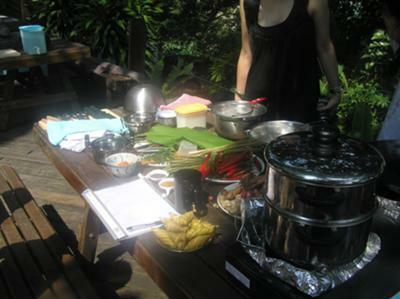 Just the food ingredients, a knife, a granite chopping block and a camp gas stove and two hours later a seafood curry, rice and some tasty sticky dessert in banana leaves was our gourmet lunch. My hands were sore from grating the coconut and my 63 year old knees were aching, but oh, how I had enjoyed myself. This was a meal made with love and a whole heap of fun and laughter. Several days later the shopkeepers in Little India saw me with shopping list in hand and John in toe happily searching for herbs and spices. They were slightly surprised that I seemed to know what I wanted and I could understand their curiosity as to why this western holiday maker was walking out of their store with tamarind fruit, coconuts and bunches of curry leaves!! It was great fun and very enjoyable. How many cooking schools can boast a beach front location ? Excellent tuition coupled with a very interesting market visit made a great morning. 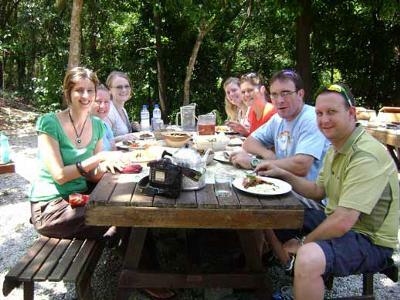 Eating our Rendang and Nasi Lemak washed down by some ice cold Tiger beer made our day. The soup was divine with very subtle flavours and the noddle dish was good too. time with your daughter, she is a lovely, friendly girl and you must be rightly very proud of her. We hope you soon get your gazebo area finished to make cooking in rain easier but you did a great job and the initial coziness of the area added to the fun and atmosphere and assisted us to all work together. If it happens again don't be afraid it is a bonus. An early morning start was followed by an eye opening walk through the morning markets. Everything we tasted/ate/drank was commented on and explained so that we got a real feel for the food, even the things that we weren't making that day. The setting in George town was delightful and Nazlina is a patient and very funny teacher. The crab curry and chicken salad were delicious and, surprisingly, not that difficult to make. I look forward to gracing her cooking classes again soon! Great cooking course!! 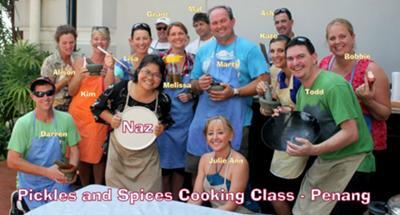 My husband and I enjoyed a day of cooking with Naz at Pickles and Spices World Cooking class. Great classic Malaysian style food. 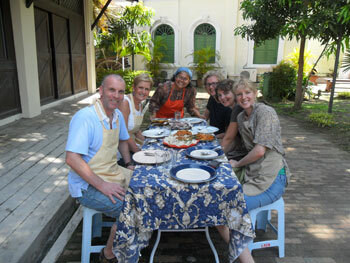 We cooked Rendang and Spice rice on the day, the best meal ever! 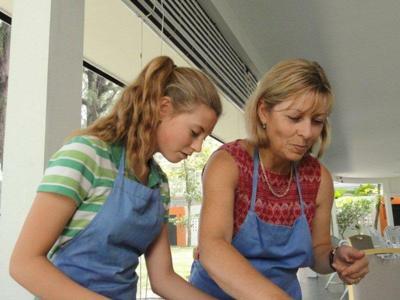 If you had enough of sightseeing, taking a cooking class is a perfect way to have a relaxing day! Happy campers at Spice Garden. I had a great day yesterday, cooking in the Spice Garden. Nazlina has a calm, friendly approach:It's more like working with a friend and she ensured that everyone was included. It was interesting using the traditional methods and realising the muscle power that was required. I think when I re-create her ideas in the kitchen environment I may be tempted to use the available electrical equipment. We were all extremely satisfied with the end product. I think I can confidently say that the Beef Rendang, spiced rice and salad could have easily graced the table of a top restaurant. We all enjoyed the meal that we had prepared and left with many happy memories of an enjoyable morning. It was great fun and I look forward to repeating it in the not too distant future. I highly recommend this cooking experience. BBC Good Food TV Shooting Experience. I just wanted to say a huge thank you to Naz - you were so incredibly well organised and efficient - we were all very impressed! Atul really enjoyed cooking with you and your recipes were fabulous. So thank you Katharine for allowing us to film in the garden and thank you Naz for being so brilliant, both on and off camera. I'll look forward to sending you the final DVD in October, and we will make sure that we put links to both of your websites on the BBC Good Food site. Thanks once again from all of us at Denhams. Jayden working hard grinding his spices. 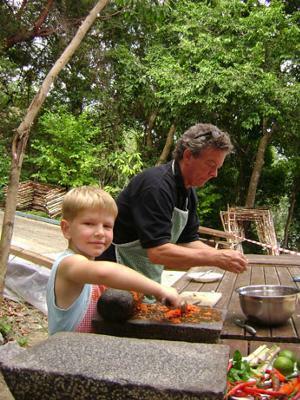 My Son Jayden and I attended this cooking class in September. We had a great time and Jayden has been telling everyone about how he can crack a coconut by himself. Thanks Nazlina for catering for a mother and son class, you were great with Jayden and he really enjoyed himself. The food was beautiful and we both look forward to cooking it at home soon. I also work as a chef and my co workers are looking forward to a Malay meal soon! !